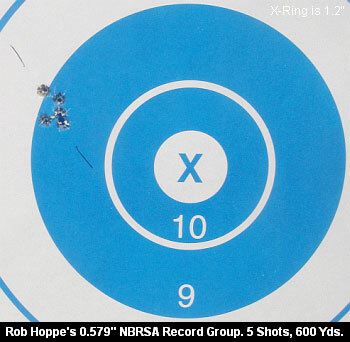 Here is a photo of Bob Hoppe’s 0.579″ five-shot group shot recently in Sacramento. This is truly an impressive achievement. Bob shot the group with a 6mm Dasher (Light Gun), Varget powder, and Hornady 105-grain Amax bullets. The group isn’t officially certified as a record yet, but I spoke to Don Nielson, an NBRSA Officer, and he believes the group will eventually certify well under 0.6″. “I measured it myself,” Don said, “and Robert deserves to be proud. 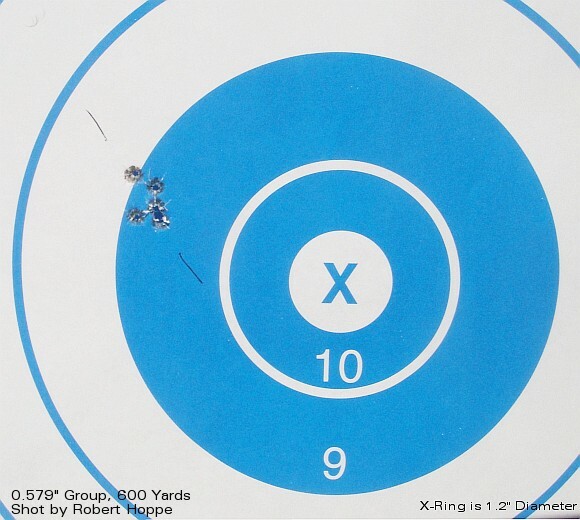 That’s one heck of a group, and we’re pleased it was shot in an NBRSA match.” Robert’s group represents the smallest 5-shot group ever shot in registered benchrest competition at 600 yards. To give you a reference, the true size of the inner, white X-Ring is 1.2 inches in diameter. Note: This photo was taken at a inclined angle with a slightly wide-angle lens. That’s why the target circles are slightly distorted. For record purposes the group size is determined by measuring centerpoint to centerpoint of the most distant bullet holes. Share the post "Hoppe's .579" Group — Best Ever at 600 Yards"
With the price of some premium scopes edging to $2500.00 (and beyond), it’s more important than ever to provide extra protection for your expensive optics. 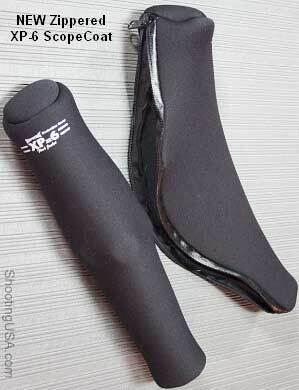 ScopeCoat produces covers that shield scopes with a layer of neoprene rubber (wetsuit material) sandwiched between nylon. In addition to its basic covers, sold in a variety of sizes and colors, ScopeCoat has released two new heavy-duty products that provide added security. The XP-6 Flak Jacket™ is specifically designed for extra protection and special applications. The 6mm-thick layer of neoprene is three times thicker than the standard ScopeCoat. XP-6 Flak Jackets are designed for tall turrets, with sizes that accommodate either two or three adjustment knobs (for both side-focus and front-focus parallax models). To shield an expensive NightForce, March, or Schmidt & Bender scope, this a good choice. XP-6 covers come in black color only, and are available for both rifle-scopes and spotting scopes. Shown below is an XP-6 Flak Jacket™ on a Leupold Spotting Scope. The newest ScopeCoat product is a 6mm XP-6 cover with ZIPPER. This is designed for removable optics that need protection when in storage. The full-length, zippered closure goes on quick-and-easy and provides more complete protection against dust, shock, and moisture. Suggested Retail Price is $30. Share the post "New Products from ScopeCoat"